Human Rights Campaign Foundation gives Kaiser Permanente top rating on LGBTQ Workplace Equality Scorecard. For the 13th consecutive year, Kaiser Permanente has earned a 100 percent score in the 2019 Corporate Equality Index, a survey administered by the Human Rights Campaign Foundation. 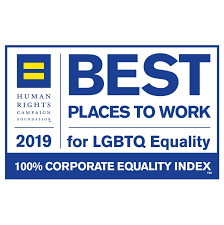 As part of this national benchmarking survey and report, which evaluates corporate policies and practices related to lesbian, gay, bisexual, transgender, and queer workplace policies, HRC named Kaiser Permanente a Best Place to Work for LGBTQ Equality. Now in its 17th year, the Corporate Equality Index report scores businesses on their LGBTQ-related policies and practices, including non-discrimination workplace protections, employment benefits, competency programs, public engagement on LGBTQ equity, and responsible citizenship. By inspiring and engaging all Americans, the HRC strives to end discrimination against LGBTQ people. It is America’s largest civil rights organization working to achieve lesbian, gay, bisexual, transgender, and queer equality.